With Fixodrain® XD 20, the protection, drainage and water retention layers are installed all in one go – including European Technical Approval. 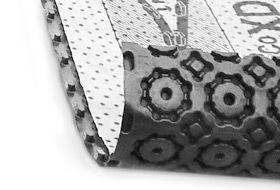 A continuous protective layer is created due to the interlocking studs along the sides of the Fixodrain® XD 20 rolls. Thanks to the pre-attached filter sheet, Fixodrain® XD 20 is easy to install – as can be seen in this photo of the roof of the Schönblick convalescent home in Schwäbisch Gmünd, Germany. 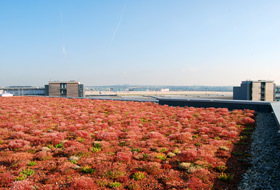 1,100 m² of Sedum vegetation with Fixodrain® XD 20 adorn the office and administration building of the German Air Rescue Service at Stuttgart Airport in Germany. 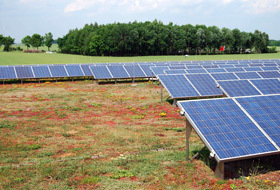 Fixodrain® XD 20 is just the right foundation for combining green and solar – and it provides for drainage across the entire area beneath the solar energy system. Intended for extensive roof areas: 18,500 m² of Fixodrain® XD 20 in combination with solar energy elements on the roof of the InCenter retail park in Landsberg/Lech in Germany. The larger the roof area, the greater the pressure on your budget. 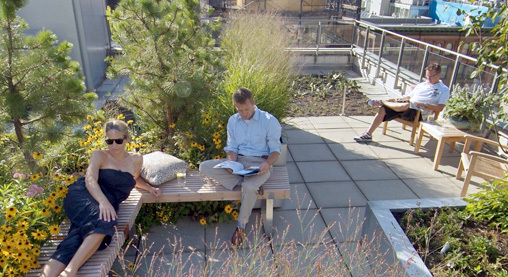 For this reason, ZinCo has created a single product that incorporates a number of the functional layers found in a green roof build-up. Supplied in rolls and with the filter sheet already attached, Fixodrain® XD 20 offers a protective, drainage, water retaining and ventilation layer in one. The system build-up with Fixodrain® XD 20 is particularly suitable for the expansive area of an extensive green roof – and even for inverted roofs. 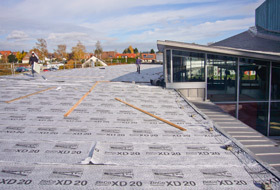 The Fixodrain® XD 20 rolls can be applied directly onto the roof membrane without the need for an additional protective mat, thanks to the large installation area and the large contact area. The elements are attached to each other lengthwise with interlocking studs, providing an unbroken protection layer for the roof membrane. 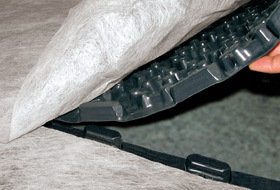 The 2 cm high Fixodrain® elements made of deep-draw polyolefin have integrated troughs on the upper side that ensure that sufficient water is retained there without it building up in the substrate. At the same time, a network of channels between the water retention troughs guarantees a drainage flow certified to DIN EN ISO 12958 standard. And, thanks to the diffusion openings and the small channels on the underside, the Fixodrain® elements can also be used on inverted roofs. The filter sheet, already attached and overlapping along the side and top edges, creates a sealed surface. This prevents fine particle penetration from the overlying substrate layer and provides the ventilation necessary in the root area. Given this sophisticated multi-layer design, a substrate depth of only 6 cm is required, meaning that the overall system build-up is only 8 cm in depth but has a water retention capacity of 20 l/m². The concluding vegetation layer with drought-resistant sedum species, can consist of plants, or dry or wet seeding. The substrate depth can, of course, be increased either in part or right across the area if a more lush vegetation is required. 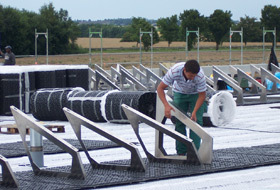 The system build-up “Sedum Carpet“ with Fixodrain® XD 20 is known for its very efficient and time-saving installation – a cost effective and permanently reliable alternative for roof areas, for example combined with solar energy systems. This has already been proven with many buildings.